Phil Taylor produced another excellent display to thrash Adrian Lewis 7-1 in the Premier League, as Michael van Gerwen went top of the table. 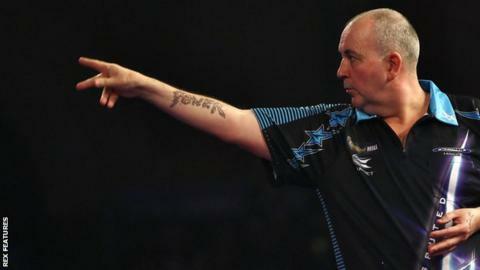 Taylor, 55, eased past fellow Stoke-on-Trent thrower Lewis in Exeter to earn his fourth successive victory. Van Gerwen, who hit a record televised average of 123.40 seven days earlier, registered 116.67 as he sent Peter Wright to his first defeat. Gary Anderson, James Wade and Michael Smith were also winners in round five. Reigning PDC world champion Anderson beat fellow Scot Robert Thornton 7-4, while Wade overcame Dave Chisnall by the same scoreline. A 7-5 win over Raymond van Barneveld was Smith's first in the Premier League. Taylor and Van Gerwen both have eight points from five matches, although world number one Van Gerwen - who begins the defence of his UK Open title in Minehead on Friday - is top of the table with a superior leg difference.